President Donald Trump invited Sarah Palin to the White House for dinner on Wednesday night, and the former Alaska governor made some interesting additions to the guest list. 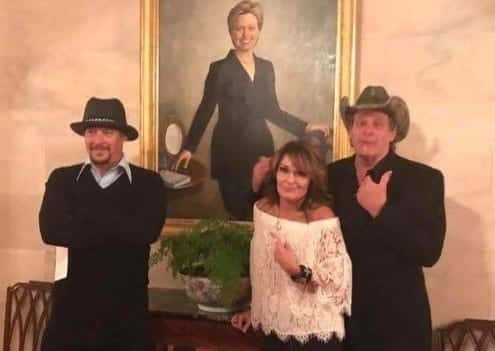 Palin uploaded photos from her night on Facebook, and they show how she and the president were joined by rockers Kid Rock and Ted Nugent. This entry was posted on April 20th 2017 at 3:27pm/15:27 and is filed under Live News Column 1. You can follow any responses to this entry through the RSS 2.0 feed.